The Youth Misery Index (YMI) spiked to a record high of 113.4 in early 2017, up from 109.9 last January, and 83.5 in 2009 when President Obama took office. The Index is calculated by adding youth unemployment, student loan debt, and national debt per capita numbers. January 20, marks the final day of Barack Obama’s Presidency. Young America’s Foundation urges the incoming wave of conservative leaders to stop the boundless climb of the Youth Misery Index immediately. America’s young people deserve better. Please contact Emily Jashinsky at ejashinsky@yaf.org or call 800-USA-1776. 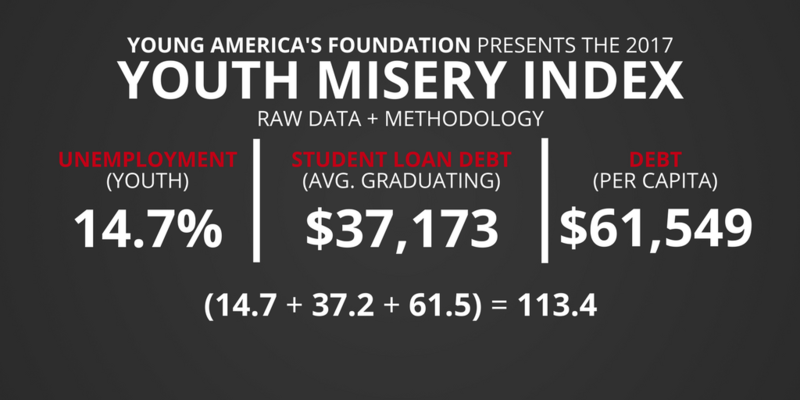 The Youth Misery Index (YMI) is a research initiative of Young America's Foundation.